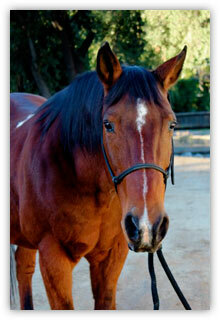 Snowpea is a 14.1 hand, bay quarter horse in his mid to late 20s. Snowpea has a very narrow stripe down his face with a star on his forehead and 3 white socks on his feet. When we got Snowpea, we were told that his nick name was “Slow Pea” because he likes to go slow. Snowpea loves peppermints, but sometimes isn’t in the mood for apples. Snowpea is now retired from the lesson program due to his acquiring a health issue at the end of 2018 that causes him to constantly bob his head (which can be a problem for those leading and riding him).